Marketers know that it is a best practice to include social media sharing buttons on the content they publish, so viewers of the content can easily share your content with friends and colleagues. But sometimes in the haste to get things done we can let little details like this slip. Marketing Automation solutions don’t forget, they do it automatically. Creating a HTML page for every marketing email you create can be tedious. But there are benefits to doing so, in case your email is not rendered properly by the recipient’s email client. And also because if it is done properly the HTML pages themselves can lend SEO “juice” to your website. Marketing Automation tools can be set up to do this automatically so it takes no additional effort on the part of the marketer. It is a rather obvious tactic that marketers should include target keywords in their blog posts to improve SEO. Marketing Automation solutions like HubSpot can actually prompt marketers to do so, identifying the fact that keywords are absent from your blog posts while you are composing them. Here’s a famous myth: it is not possible to track the effectiveness of social media marketing. The fact is, it is just as easy to measure the inbound traffic and leads generated by social media as it is for any other form of online marketing (email, PPC, etc.). You just need to generate coded links for each social media post so the source can be tracked. The problem is it is a tedious exercise to create those coded links manually because the volume of social media posts is typically much greater, and social media marketing managers have simply lacked the discipline to do it. But Marketing Automation tools can automate this process. 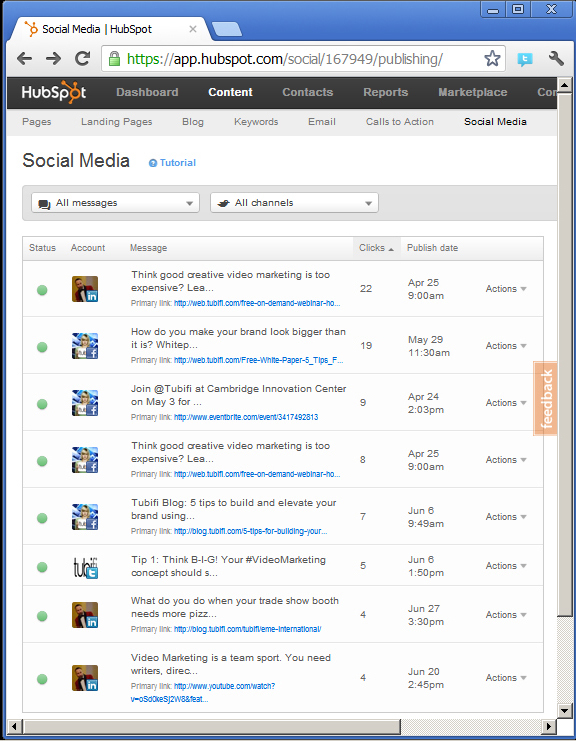 See the screen shot of HubSpot’s Social Media Publishing tool. Each post can be scheduled and the results can be tracked. In fact you can see that Social Media Marketing can produce results just as well if not better than other measurable forms of online marketing. HubSpot’s Social Media Publishing tool let’s you schedule posts and status updates so they are posted at the time when they will make the most impact. Also, note that clicks are tracked for each post. See more detail on how to automate Social Media Marketing with HubSpot. HubSpot reporting shows us Social Media Marketing results. You can see that in this example Social Media Marketing is driving significant lead conversion (only email marketing is performing better).